We first met Michael through John and Leslie Veale when we were partners in G-whizz. Michael had recently retired and had just ordered a Jeanneau Sun Odyssy 379, which was to became named “Agrovation”. 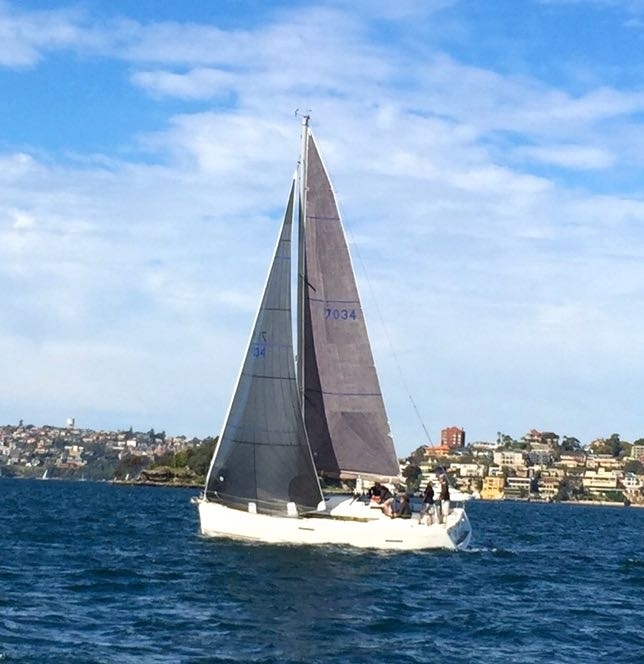 Michael is a very accomplished dinghy sailor, the winner of a number of State and National championships, however he had little experience in keel boats. The idea that John had was that we would take Michael on board G-whizz as a way of giving him some experience with the bigger boats. As it turns out I am not too sure if we did Mick a favour or not, his original intention was to have a nice keel boat that he and his family could enjoy as a cruiser. Ever the competitive soul Mick quickly saw the potential for racing Agrovation. After taking delivery of a very nice Jeanneau 379 set up beautifully for family cruising, he then went about kitting her out with some more performance orientated equipment, including a wardrobe of hi-tech sails. Agrovation after the start of a RANSA race, with Darling Point in the background. He now races Agrovation regularly fortunately for us, or unfortunately as the case could be, we compete in the same division at Greenwich Flying Squadron. We have raced against a number of Jeanneau 349s, 379s and 409s in various events and have in most races been able to hold them at bay. Except for Agrovation. Could this be the fastest Jeanneau 379 about? Possibly so, but more a tribute to Michael’s sailing ability, when combined with the undoubted ability of most of his crew, many of whom are also noted dinghy sailors. Michael still occasionally crews with us on G-whizz and when we are not racing G-whizz, We are quite often welcome to crew on Agrovation, an experience that I always savour, inevitable I come away knowing more about racing a sail boat that when I boarded. Ann has nicknamed Mick the “Wind Whisperer” recognising his ability to read the wind. I alluded to Mick’s abilities in the news item Never Ever Give Up . Michael is one of nature’s gentlemen, while I’m not too sure of the reasoning behind the naming of Agrovation, I am sure that it is not only a play on Michael’s family name but also an ironic twist to his personality. Michael’s crew are not only extremely competent, but also a great group of guys, it’s a pleasure to spend time with them on and off the water, as team mates or as competitors. I must state, with apologies to Michael and Jason (Mick’s son and also a National sailing Champion) that when father and son are crewing together there is quite often a robust discussion concerning tactics. Now that David Edmiston has a new and Larger boat in “Passion X” and is sailing in a different division, it is Agrovation that we target and if we can stay with her on the race track we know we have sailed well. All that I said about the racing ability of Agrovation and her crew, it is also gratifying that she also gets a lot of use in her originally intended purpose, family cruising. Mick is lucky to have such a versatile boat. Agrovation has found a good home.